Hoedeopbap is one of my all-time favorite dishes, so I’m happy to show you how to make it. It’s made with raw fish, rice, and a spicy seasoning sauce – it’s cool and soft and melting in your mouth, and fresh and spicy. The key to this dish is to make sure the fish is served cold cold. You might have guessed already that I love fish, and especially raw fish. So when I went to Mexico and stayed at the beach, I could meet the fishermen as they brought their catch in, early in the morning. No middleman, I could buy the fish as fresh as possible. When I got the freshest fish in my hand, hoedeopbap was a good choice. 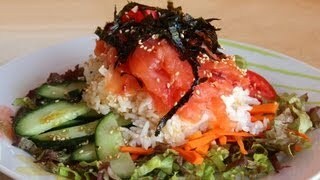 It’s refreshing and easy to eat: you mix it all together in a big bowl, like a raw fish bibimbap. 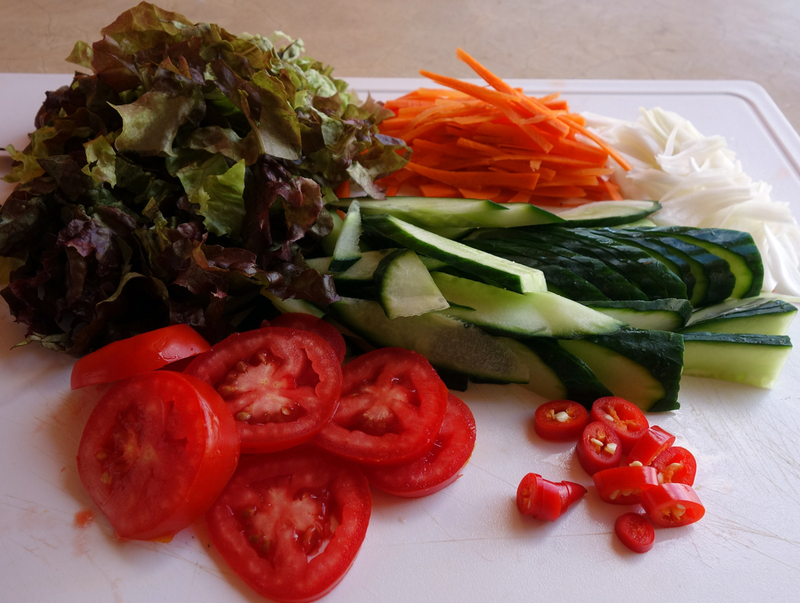 Unlike bibimbap, the vegetables are uncooked, so it’s a lot simpler to prepare. Hoedeopbap with a bowl of doenjangguk (soybean paste soup) simply can’t be beat. You can make a quick vegetarian version of this by substituting the fish with fried tofu. Also, if you like mint or perilla leaves, add them to the dish. This is another video that I remade as the original was done in 2008. One of the reasons I’m redoing these older recipes is because they are blocked in some countries due to music copyright laws. In those days, I just used whatever music I liked in my videos, which is causing some problems now. Nowadays I create all my own music. So for some people, this is their first chance to watch my hoedeopbap video! Shave the fish thinly. Keep in the refrigerator. 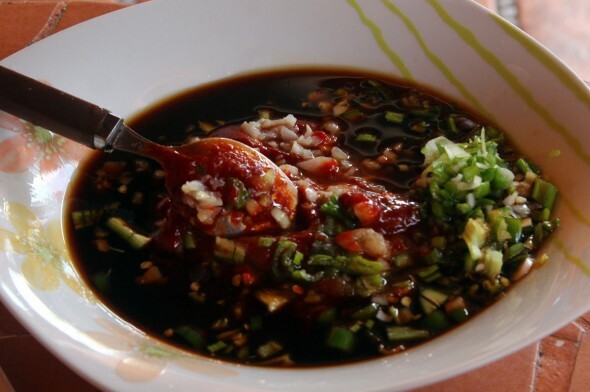 Combine the soy sauce, hot pepper paste, green onion, garlic, green chili pepper, sugar, and vinegar or limes in a bowl with a spoon. Keep in the refrigerator. Put lettuce on the bottom of a plate or large shallow bowl. Add the cucumber, onion, carrot, and tomato and arrange them nicely. Place the rice in the center of the vegetables. Add the fish, shredded gim, and red chili pepper on top. Sprinkle with roasted sesame seeds and drizzle the sesame oil. Add the seasoning sauce over top of the fish, and gently mix all the ingredients together with your spoon. Heat up a pan and add a little vegetable oil. Dice tofu into 1.5 cm cubes. Put them into the pan and cook until golden brown. 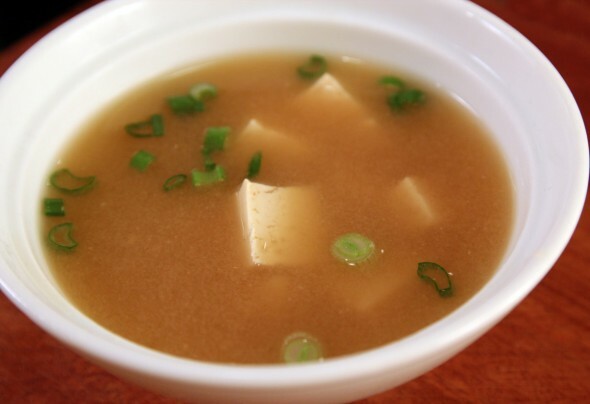 Turn off the heat and add 1 ts of soy sauce and 1 ts of sugar. Stir until the tofu is coated. Put 5 cups of water and 8-10 dried anchovies (with the heads and guts removed) in a pot and boil for 20 minutes over medium high heat. Remove the anchovies from the pot and add 1½ tbs doenjang (soybean paste). Lower the heat and simmer for 10 more minutes. Dice 1 cup of tofu into small cubes and add them to the pot. Boil 2 to 3 minutes, then turn the heat off. Chop up 1 green onion. Sprinkle some over each bowl of soup just before you serve them. Posted on Monday, August 18th, 2008 at 7:19 pm. Last updated on April 26, 2015. Posted November 1st, 2017 at 8:58 pm | Log in to reply. Hi everybody, I am starting to sound like Maangchi! Love the energy, I will have to beg someone for fresh fish, I live in central west Queensland, far away from the sea, but some lucky people have a boat and go fishing! Always excited to view your clips. Posted July 31st, 2017 at 6:35 am | Log in to reply. Hi Maangchi, We already loved dolsot bibimbap. Even bought the pots some years ago. Then I discovered your hoedeopbap on the website over a year ago. We have been eating this raw fish salad once a week ever since. It is just perfect! I usually make a double batch of the sauce so I have some for another salad(s) in the day(s) that follow. I have no idea if cilantro is used in Korean cuisine, but I love to add some to my hoedeopbap. Thanks for your inspiring videos and recipes! Posted August 20th, 2016 at 5:23 pm | Log in to reply. Thank you for your recipes. Unfortunately, I can’t cook rice well, thats why I want to buy rice cooker. Do you use rice cookers? What do you think about this one http://cooker.guru/zojirushi-ns-tsc10-review? Posted August 21st, 2016 at 11:38 am | Log in to reply. 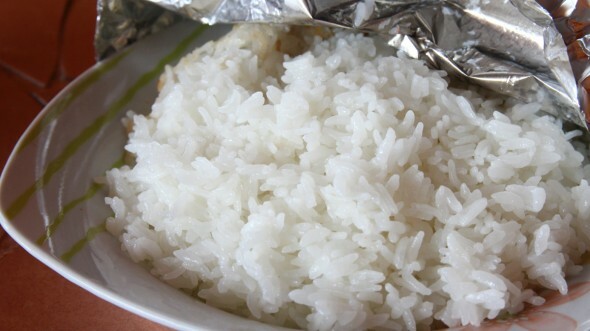 Yes, you can use a rice cooker including the one you posted the photo here to make good rice. Just follow the direction in the instructions. Posted October 2nd, 2013 at 10:00 pm | Log in to reply. Great site, sunshine! My love enjoys her sushi. She loved sashimi. I gave her chirashi and she was hooked. I told her of this holy deliciousness and she scoffed, as did I the first time. Fellow gives me a gorgeous plate of raw fish, then my guy smashed it to a pulp with sesame oil and hot sauce! Hell no! Then I tasted it…. Heaven. I made my love this dish tonite, and she balked at the smashing. Then. She said. Oh. Ohhhh…. OH! Ohhhhh! Wow! Now she understands! More sauce! More! More!!! Lol. Thanks a ton! Posted June 29th, 2011 at 12:02 am | Log in to reply. I’d never had hwedupbap before but now I love it! I’m looking forward to trying it with tofu next time. I’m cooking from your site for the next few weeks and writing about it in my blog. Here’s the link to my attempt at making your recipe: http://pantryshopper.blogspot.com/2011/06/maangchi-2.html. Thanks so much for all the work you put into these fabulous recipes! Posted June 29th, 2011 at 6:25 am | Log in to reply. yes, I read your blog! It looks very delicious! “I spent $10 on the sashimi, which was enough for two people… ” The other day I had hwedupbap at a restaurant. It cost about $20.00! It was good but I still preferred my homemade hwedupbap with more ingredients. Good luck with making vegetarian hwedupbap with tofu! Posted March 20th, 2011 at 12:11 am | Log in to reply. I was wondering, I just had a similar dish at a japanese restaurant and thought I gave this a try. Do I just use normal rice or do I use sushi (w/ sushi seasoning) rice? Posted March 20th, 2011 at 7:00 am | Log in to reply. yes, use short grain rice which is also known as sushi rice. Posted December 10th, 2010 at 5:37 pm | Log in to reply. I love korean food and I’m so glad I found your site. I have a few questions. Do I really have to use Perilla Leaves? Cause I can’t find it anywhere! Thank you very much for your responds. Posted December 11th, 2010 at 8:38 am | Log in to reply. Skip perlilla leaves if they are not available in your area. You could replace it with mint leaves. Posted May 4th, 2010 at 7:31 pm | Log in to reply. Posted May 12th, 2010 at 4:28 am | Log in to reply. If you have ever eaten ume (japanese sour salty plum) that is what flavors it. If the lady who runs the store is familiar with Japanese ingredients she may know perilla leaves as shiso leaves. I live in a very small town and they are not available in the two oriental stores that we have but we did have a gardener at the farmers market that was selling shiso plants both the red and the green so you may want to check your local farmers market as “exotic” greens are hip now days. Good luck in your search and Happy eating. Posted March 14th, 2012 at 11:24 pm | Log in to reply. I agree, shiso leaves is as close as you can get to a replacement for perilla leaves. I live in Japan, and although they look similar, the ones that Japanese people typically eat taste very different from the Korean perilla leaves, they’re not the same type, though it may be the same Genus. But you can use that as a substitute just fine. Posted April 28th, 2010 at 10:53 pm | Log in to reply. I think I am going to try this recipe soon! It looks so healthy. I think I will try it without the rice though…. Do you think it will still be tasty? Posted April 28th, 2010 at 11:08 pm | Log in to reply. Posted October 25th, 2009 at 3:07 am | Log in to reply. Posted April 28th, 2010 at 11:09 pm | Log in to reply. Posted October 19th, 2009 at 10:50 pm | Log in to reply. oh and what is the korean name of the tofu soup again? Posted October 20th, 2009 at 7:58 am | Log in to reply. Posted October 20th, 2009 at 7:34 pm | Log in to reply. i meant the soybean tofu soup that goes along with 회덮밥. Posted July 13th, 2009 at 1:12 am | Log in to reply. Thank you for sharing your wonderful Korean recipes. Your videos are just awesome! Now I get to learn to make my favorite Korean food. I have a question about fresh dduk. According to the package, these fresh dduk must be discarded after 24 hours. Mine says today’s date. 1. If I don’t keep them in the refrigerator tonight, is it still okay to use them tomorrow? 2. The package only comes with a date and no time, so how do I know when it’s past the 24 hours period? Posted July 13th, 2009 at 7:16 am | Log in to reply. I usually keep fresh leftover dduk in the freezer and thaw it out at room temperature before eating or cooking. Posted June 7th, 2009 at 2:15 am | Log in to reply. Posted May 26th, 2009 at 2:26 pm | Log in to reply. Posted May 26th, 2009 at 3:50 pm | Log in to reply. ok, you must like chobap! so do I! This recipe was originally posted on August 18, 2008 at 7:19 pm by Maangchi. It was last updated on April 26, 2015. The video was watched 350,103 times on YouTube & has 3,783 likes! This video is a remade version of an earlier recipe. The original video was posted on 2008-08-19 and has 81,112 views.